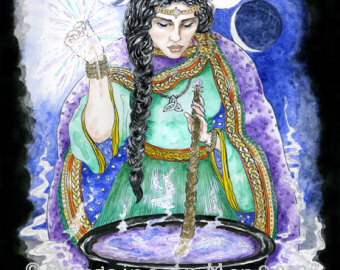 The shamanic Witchcraft I offer is not limited to traditional Celtic-European Wicca. We live in a marvelous melting cauldron and my techniques are derived from all of my studies and explorations, which include Tantra, Taoism, Reiki, Zen, Kundalini Yoga, Native American, African-Carribean and New Age teachings. As a friend of mine once said, “I practice Witchcraft exactly as my ancestors did 60,000 years ago-I make it up.” My goal is not just to transmit information to you but to develop your trust in your own intuition and inspiration so that you can ‘make up’ an effective, sacred, spiritual- magical path which-like the willow from which Witchcraft is named-will be strong enough and flexible enough to support and enrich you throughout your whole life. By the end of this training you will be proficient in creating sacred space, sensing, raising and directing energy, and journeying (trancework). You will be grounded in the earth, centered within yourself, your core, your essence. You will know yourself far more deeply. You will have acquired powerful allies. Mysteries and secrets will have been transmuted into knowledge and skills. Ritual: How to create powerful, effective ritual utilizing such techniques as breath-work, trance, chanting, movement and art. How to raise and direct power toward specific outcomes and seasonal celebrations. The Elements of Magic: The elemental powers of Air, Fire, Water and Earth correspond to the human powers of spirit, will, heart and body. The shaman must be able to evoke and invoke a balance of these qualities. We will explore the particular styles of magic each of the elements has to offer. Group Bonding: How to work within a committed group to potentiate each other into our fullest power. Like love, power multiplies and intensifies as it is shared, and group-mind is a mirror which is an invaluable tool for deepening self-knowledge. Experience the power that a coven has to offer. Reincarnation: We will explore our vast multi- dimensional selves through time-travel, reclaiming our strength and wisdom. We will also experience our personal Goddess/God archetypes. Psychic Development: You will be introduced to scrying, tarot, pendulum work, energy sensing, hands-on healing and healing at a distance. Contact with the Dreamtime: We all have unseen allies, friends in the spirit world who can guide and assist us on our path. these allies-including our animal totems and our spirit parents- will become real and accessible as a result of this course. You will develop an internal ‘Place of Power’ which will serve as a wellspring of inspiration and a contact point with hidden realms. You will also learn to balance and make use of your chakras and your inner family of male and female, older and younger selves. Emotional Release and Clearing: How to transform what we think of as ‘negative’ emotions into pure energy. Fun! : In Goddess traditions, Isis states, “All acts of love and pleasure are my rituals.” The universe is both sacred and hilarious and the pleasures and dilemmas of being human especially so. While magic requires our seriousness and devotion, humor and silliness are integral parts of enlightenment. Your tuition is $125 per 12 hour session, $1925 total for the year. This covers all instruction, materials, and room rental. A $300 non-refundable deposit is due before the first class begins. Beginning on April 23rd, 2016, each of the 13 sessions will take place on a Saturday from 11 a.m. to 11 p.m. Bring food and drink for potluck lunch and supper. Your commitment is for the full year and a day, the traditional time required for Wiccan apprenticeship. During the apprenticeship program, private sessions with Cerridwen will be available at a reduced rate. Here’s a little video made by my apprentice Nicole Tostevin from the footage she shot during our outing to the sacred salamander pools while we explored the realms Betwixt and Between the worlds. Wading with Salamanders from Nicole Tostevin on Vimeo.